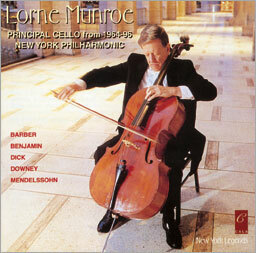 Formerly Principal Cellist with the Philadelphia Orchestra, Lorne Monroe began a 32-year tenure with the Philharmonic in 1964. Beginning his cello studies aged five in Winnipeg, he studied in London with Ivor James and with Piatigorsky at the Curtis Institute. He made over ninety solo appearances with the Philharmonic, in addition to a worldwide performance career.